2006 is drawing to a close and now is the time to reflect on the year that has passed. I rarely hear people talking about the highlights of their year being things that they have bought or money they've earnt; often it's experiences that money can't buy (such a cliche, I know!). When I look back over the last year, memories flood back of time spent with my son, friends and family; places I've visited, new things I've discovered and memorable walks I've been on. Spring 2006 - March and April I spent researching, walking and writing my new Yorkshire Water Way book, and had three memorable days walking from Kettlewell in the Yorkshire Dales to Ilkley. The fell-tops were dusted with snow, the days were bright and crisp and the views were superb. The area around Scar House and Angram reservoirs in Upper Nidderdale makes for fantastic walking country with a sense of wilderness, whilst the reservoirs add interest. 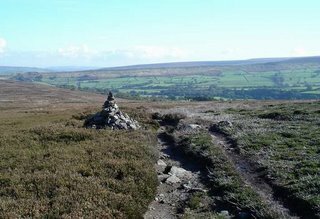 From the Summit of Great Whernside, I followed an old packhorse route down across the moors skirting Angram and Scar House (pictured) to reach Middlesmoor. Autumn 2006 - Some of the best walking can be found in the North York Moors. 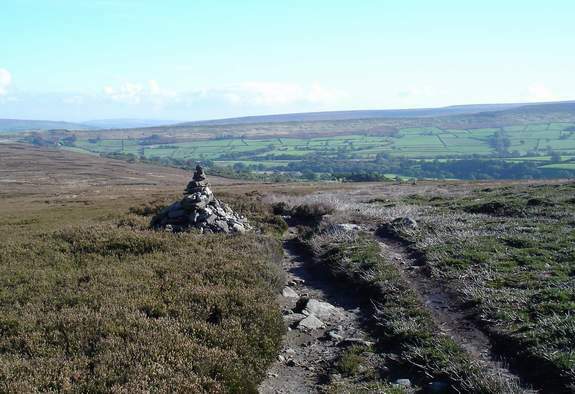 There are vast swathes of heather moorland, deep green valleys, lovely villages and cosy pubs. It is much quieter than other National Parks, all of which makes for some great walking. One of the best walks I did was on an unseasonally warm October day through Baysdale to the scant remains of Baysdale Abbey (actually a nunnery). The light was perfect with long shadows and an autumnal glow across the dying flowers of the heather. Hopefully, 2007 will bring just as many experiences. Just a reminder... If you are ordering some of our books via our website or Mail Order for Christmas presents, then the last posting date to guarantee Christmas delivery (according to Royal Mail's website) is Saturday 16th December. After this date, we will still continue to send out books the same day as we receive the order, which should arrive before Christmas as long as the order is placed before the 19th December (although Christmas delivery is not guaranteed). Let me know your thoughts and comments about the article by posting a comment below. 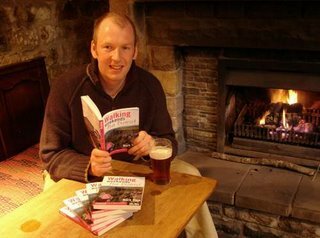 Launched my new book "Walking Weekends: Peak District" today at the Devonshire Arms at Beeley (on the Chatsworth Estate). Marketing, publicity and promotion is the biggest challenge for any publisher as you are competing with thousands of other titles and also with big publishers with large marketing budgets. My marketing budget stretches to a pint of beer in a Peakland pub! anyway, fingers crossed and hopefully this launch will produce some good coverage over the next few weeks. 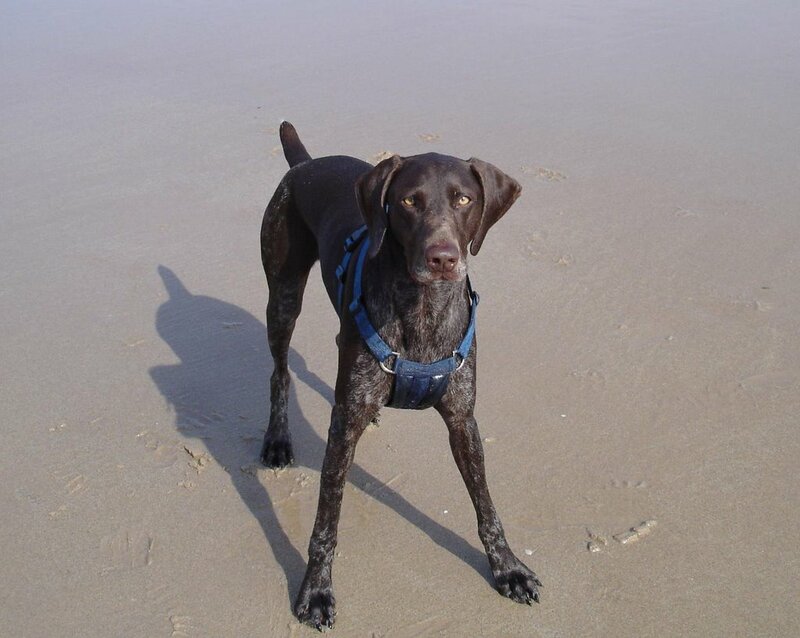 By the way, the headline of my press release read... "LEAVE MUDDY BOOTPRINTS INSTEAD OF CARBON FOOTPRINTS. 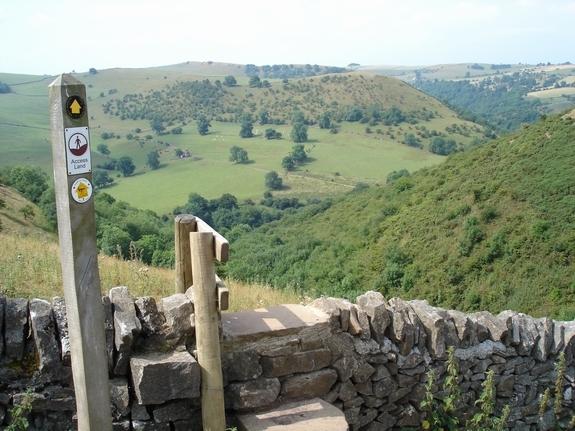 Spend a weekend walking through the Peak District and help save the planet." 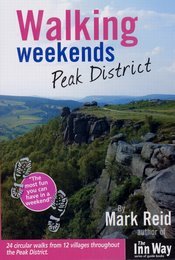 Not only does this book promote sustainable tourism by encouraging people to spend a weekend walking, eating, drinking and staying locally but for every copy sold I donate a % of the profits to the Peak District National Park Authority to be used for conservation projects within the National Park. No there's a good reason to buy my book! I'm off up to the White Lion at Cray (the highest pub in Wharfedale) tonight for a weekend of walking and drinking with 9 other blokes! 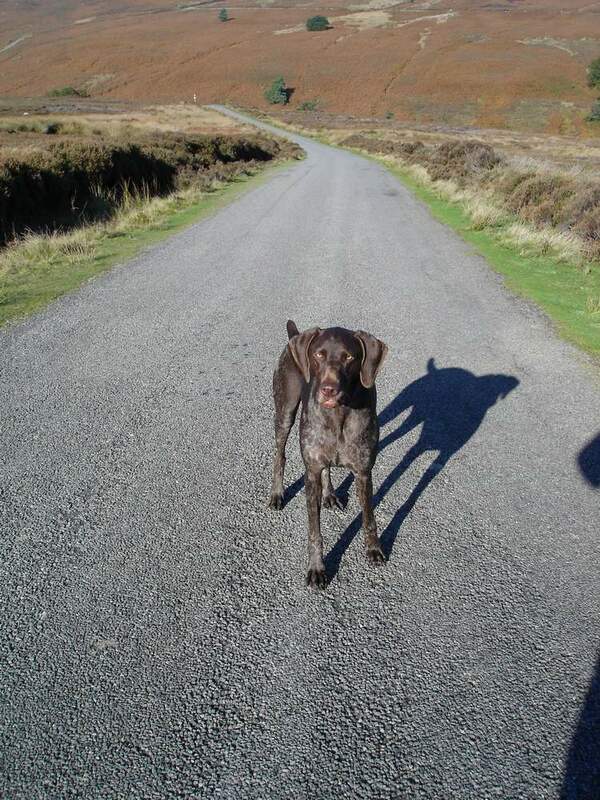 Should be fun... We head off twice a year (spring and autumn) for our walking weekends, staying at great country pubs and then doing a full day's walk on the Saturday and an easier stroll on the Sunday. This is what life's all about... two days spent walking through some of England's finest landscapes in the company of friends and then a convivial evening at a traditional Dales pub with its stone-flagged bar, oak beams and roaring fire. Not to mention the local ale... it's Copper Dragon and Moorhouse's at the White Lion. On Saturday, we're going to climb up to the summit of Buckden Pike (703 metres) then walk along the ridge down to Kettlewell for lunch. 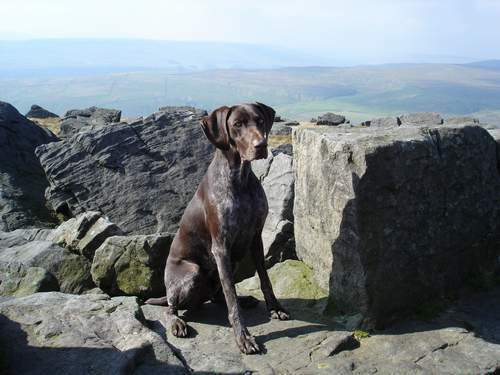 The afternoon section is back up through Upper Wharfedale to Cray via Starbotton (Fox & Hounds) and Buckden (Buck Inn). If you're near Harrogate this weekend, pop into the Crafts for Christmas Fair and say hello - I've got a stand selling my books as well as my new "Walking Weekends: Peak District" which is due back from the binders on Friday, so it will be literally hot off the press! 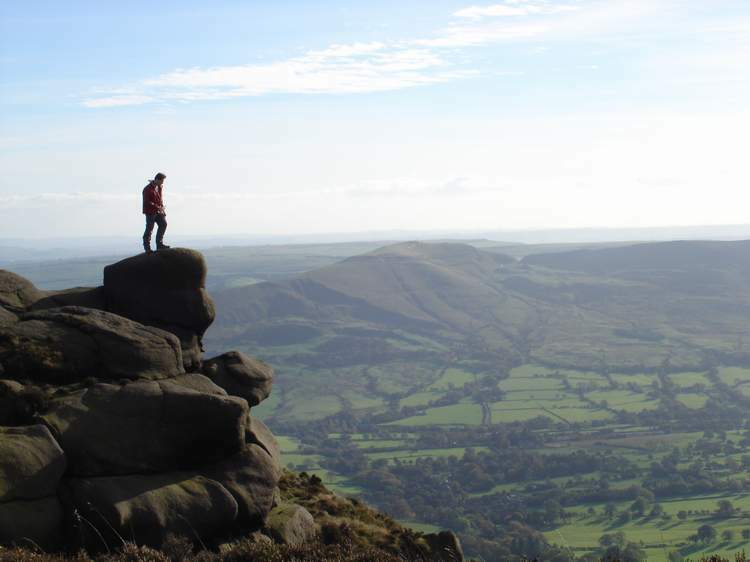 Anyway, had an great time in the Peak District with The Sunday Times journalists last weekend. We stayed at the newly-refurbished Devonshire Arms at Beeley (great food, stylish bedrooms, good service but rather too bright decor especially the flourescent pink plastic bar stools!) and the George at Castleton (traditional village pub with flagstone floors, open fires and generous portions of lamb shank!). The walks we did were from Beeley to Bakewell then back via Edensor. 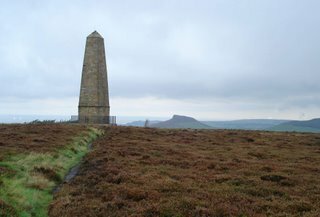 Also, from Castleton we walk up onto Win Hill then down to the Yorkshire Bridge before skirting around Ladybower Reservoir then back to Castleton via Hope Cross. 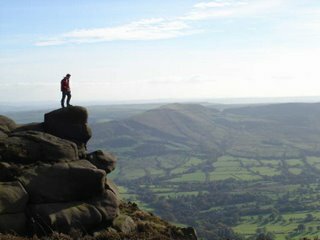 The final walk we did was from Edale up onto Kinder Scout via the Woolpacks and Jacob's Ladder - see photo above. The article will hopefully appear in the travel section of the Sunday Times in late November. The best beer was a pint of Copper Dragon Pipkin at the Yorkshire Bridge Inn closely followed by Hartington Bitter at the Cheshire Cheese, Hope. I finally did the walk around Baysdale last week on a wonderfully warm autumnal day. 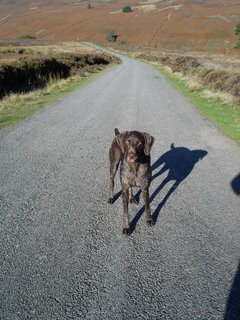 Elvis enjoyed himself as he loves running across heather moorland (see photo above). Finished writing the book today... only taken me two years of research! Now's the boring part of editing, proof-reading, page layout etc. I went out yesterday for a walk around the deep wooded gorge of Causey Burn, spanned by the superb Causey Arch. This giant stone bridge towers 80-ft above the gorge with a span of over 100-ft. This is the world’s oldest railway bridge that was, when it was built, the largest single arch bridge in Britain. It was built in 1725 as part of a five-mile waggonway between the collieries around Tanfield and the Dunston coal staiths along the Rive Tyne. This was the first major engineering feat of the Industrial Revolution. 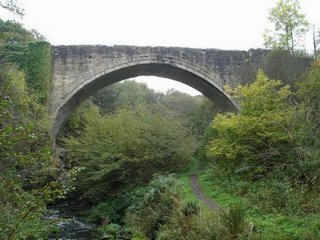 During the 19th Century, the waggonway was upgraded with iron rails and steam locomotives and an alternative route opened from Causey Arch to collieries at East Tanfield. This railway continued to transport coal to Tyneside until it closed in 1962. Today, the section from Sunniside to East Tanfield is operated as a preserved steam railway - the oldest working railway in the world. Read it in this Thursday's Northern Echo. 20 walks down, 4 left to do... and then my "Walking Weekends Peak District" book will be complete! Well, almost. I'll then have 24 maps to draw, proofing, re-walking two routes... This book has to be out by the 9th November as I'm doing the Crafts for Christmas Fair at the Great Yorkshire Showground. 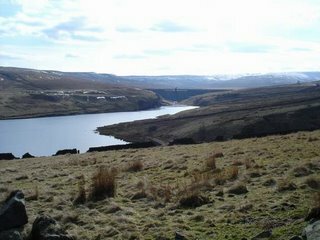 But in the meantime, I'm off tomorrow morning to do a walk around Marske Beck (tributary of the River Swale) near Richmond - I'll let you know how I get on. "nearby is the Old Original Bakewell Pudding Shop that still makes Bakewell Puddings (not tarts!) from the original recipe. This famous delicacy was inadvertently invented during the 1850’s at the Rutland Arms Hotel when the cook made a mistake and poured the pastry mix over the jam instead of the other way round and so created a pudding instead of a tart! " I'll let you know how I get on around Baysdale - I might even post a photo, if I can work out how to do it! It's just turned October 2006 and I've now spent the last 18 months researching my Peak District books, and I still haven't finished them! 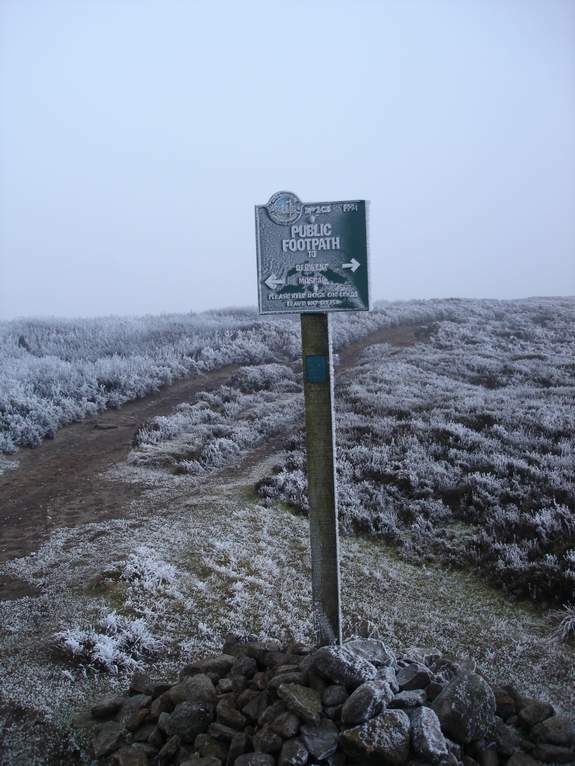 My "Walking Weekends Peak District" book is getting there, slowly. I've walked all of the 24 routes but I've still got 6 left to research and write up - and they take about 2 or 3 days to do each one. Realistically, I should get the book finished by the end of October. It will be a great book when it's finished as there are some superb walks featuring some great pubs. Because it is such a popular walking area, it has taken me much longer than I thought researching it as I need to be confident that my finished books will showcase the very best the area has to offer. In the meantime, I'll be heading out tomorrow to do a walk for my weekly column in the Northern Echo. I think I'll head up to County Durham, but I haven't decided where yet! 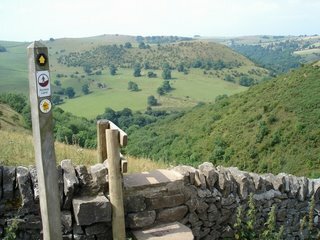 It'll probably be Hob Hole and Baysdale near Castleton. The finished walk will appear in this week's newspaper on Thursday.